What is "Print To File" used for? 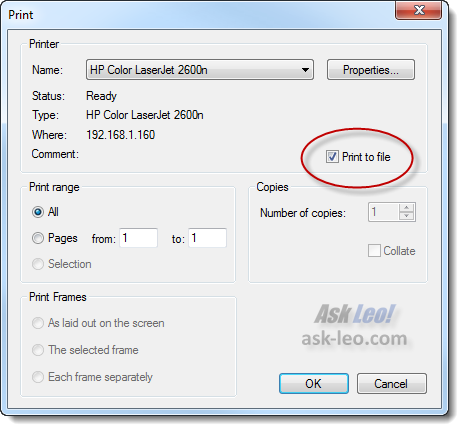 Print to file is an option on many print dialogs that sends printer output to a file rather than the printer. It's of very limited utility these days. I am puzzled by a little item called "Print to file". I am loathe to experiment with it (from another painful experience!!). Nevertheless, I would like to know what it is, what it does, what it's for, and if or when I should actually use it . Does it have any practical benefit or is it simply a technical appendage? The super-short version is that it's somewhat of a relic. Unless you know that you have a specific need, you can safely ignore it. It's highly unlikely that you'll ever have a specific need. This option may appear in different locations on different print dialogs, but in general, it means the same thing. Printing is really a kind of conversion process. For example, when printing a web page, the software involved in the printing operation "translates" the web page that you see from its original HTML into instructions that are specific to the printer that you happen to have. These settings cause the printer to print what you see. Many printers are different and have different sets of instructions. Even when printers are similar (for example, many printers use the "postscript" page description language), each printer has its own features and quirks. When an application prints, it communicates with the standard Windows printing interface, which communicates with the driver for the selected printer; this then transforms the printing instructions into whatever language it is that your printer understands. The result is then sent to the printer which then presumably prints what you intended. If you select the Print to file option, the data that would normally be sent to the printer is written to a file instead. Typically, the output is saved as a ".prn" file. The idea is that if printing in your application is a time-consuming or inconvenient process, you can click Print once and save the output of that print process. Then, any time that you need an additional printed copy of that document, you simply copy it to the printer. Copying a ".prn" file to the printer is typically as simple as dragging and dropping the file onto the printer icon in Windows Explorer, or entering a copy command like "COPY FILENAME.PRN PRN" in a Windows Command Prompt. Given that printing directly from the original document isn't typically that difficult of a process, there's little need for printing to a file any more. And, in fact, there are a few reasons why you might not want to. While researching this article, I tore my hair out for a while dealing with that error - "An unknown error occurred while printing". Not a very helpful message. Not all printer drivers support "Print to file" - even if the checkbox is enabled. It's possible that once you get an error trying an unsupported Print to file, you'll continue to get that error even when you don't select Print to file thereafter. That persistent error situation might be resolved by selecting a different printer and successfully printing to that, once. It's good to have more than one printer in your system. Finally, a use for the "Microsoft XPS Document Writer". If you're like me and like to experiment a little, hopefully that little discovery will save you some time if your printer not support Print to file. As you can see from the description of how it works above, a file created using Print to file is specific to the printer that was selected at the time you printed. The file contains the set of printing instructions for that printer. That means that you cannot take a ".prn" file created by Print to file and expect it to work on just any printer. At a minimum, it'll only work on printers that are compatible with yours - possibly only on the same make and model of printer. A much more portable approach to printing to file that typically does more of what most people expect, is to use a print-to-PDF printer instead. PDF files are portable, readable on almost all computers, and can themselves be printed again on whatever printer you have installed. As you can see, Print to file really has very limited utility. But at least now, you know why you don't need it. How do I remove a document stuck in my printer's queue? Every so often the Windows Print Queue will get "stuck". Everything looks like it should print, but it won't. We'll clear that up. Why don't PDF's print at the same size as the original? When a PDF is printed, even though it may be standard sized pages, the printer may add margins. You can adjust this behavior when you print. How do I print an email with its attachments? OMG! Thanks so much for the person who asked this question and thanks Leo, for choosing this question to answer. I have tried to find an answer to this and never came up w/ anything I could understand. Everytime I see it...I think what the heck does that mean? And it bug me that I never knew, but now I do. Thanks again! Does not work. You also need /B flag. I still could never even get that to work right, either. Nowadays, as you say, just stick to printing to PDF and XPS and ignore the "print to file" option. I'm not sure, but... perhaps "Print to file" is also useful when a given app is not available? For instance, you print a CorelDRAW ".cdr" file to file and take it on a USB thumb drive to another computer where CorelDRAW is not present, so you can – given all other stuff allow you to – print the .cdr file there? I'm interested in this "Print to PDF" option. I don't remember seeing that. Where is it available? Check out CutePDF Writer at http://go.ask-leo.com/cutepdf - it's a printer driver that you install that then allows you to "print" to PDF. XPS is Microsoft's attempt at similar functionality, I believe, but it's not nearly as widely compatible as PDF. I highly recommend "CutePDF", a free print to PDF file program which has worked very well for me. It installs itself as another printer which can be used with any program to create a .pdf file instead of printed output. Print to file or save to file is used quiet often to create a post script file, especially when using graphics applications that can then be opened or converted by using acrobat distiller to create a .pdf file. This type of file can contain all of the notes and information used to create the original file and is helpful when sending the file to another printer or service bureau. The original printer selected must use the post script language. still use it on a regular basis. CutePDF is a free "print-to-PDF" product - works very well - highly recommended. XPS is "XML Paper Specification", which is basically (AFAICT) Microsoft's attempt to replace PDF. The "Print" facilities to a PDF File such as CutePDF above, are extremely useful for creating files recording transactions such as Flight Ticket Receipts, Boarding Passes etc. I do a fair amount of business flying (been "retired 12 years! ); and this is an easy way of keeping track of costs, times etc, for submitting Expenses Claims at a later date. Print to File is also used within accounting software to enable printing of reports to files of several types, usually text or spreadsheet files. In this case it has no printer codes and can be opened and reviewed or re-printed later. Most people now just print to pdf files for this purpose. About 15 years ago I used Print-to-File frequently when setting up printers to print on preprinted forms. Looking at actual code sent to the printer - and a copy of the printers communication protocol - facilitated finding exactly what needed to be tweaked to get a correct output. Now, I generally print both form and content at the same time onto blank paper. I like CutePDF, but prefer doPDF. Maybe just because it's the first one I used, and I trust it. Just another option. I run it on 64 bit. I love these articles about the obsolete stuff. It is hard to believe that I have been playing with computers so long now that I get nostalgic about things like the memory of my old Panasonic dot matrix printer sounding like a grinding wheel sharpening an axe. Oh no! The dinosaur DNA in me has finally appeared. Back in the good old bad old days, I worked on some of the early CAD systems that had very limited printing ability to more common printers (we typically used more specialised plotters such a couple of monolithic XEROX plan printers). Also, doing file transfers to many clients was impracticable as the files were too big to fit on one disk and inevitably, one of the spanned floppies would fail at the client's. So, we used to create print files using the drivers available on the CAD software that matched available printers at our clients. That would fit on one floppy that could be stuck in the shirt pocket and hand delivered. When .pdf software became available it was inevitable we'd go down that path and the internet was coming down the turnpike too. These days engineering offices just email or ftp the files to the client and IF they want a hard copy, their CAD software has drivers for every printer under the sun. Just one comment on the error message that you included. Every time I see a similar message, "An unknown error has occurred....", it makes me wonder if there are any "A known error has occurred..." messages? If it was known, it couldn't exactly be classified as an error, could it? I'll reiterate that a "print to PDF" solution is more portable for this situation. 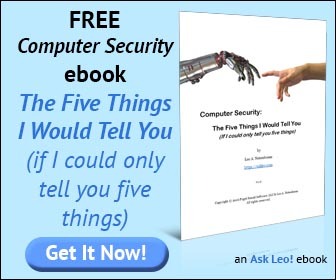 The resulting files are significantly more likely to work as you change computers, printers and whatever else over time. I teach a monthly Windows class for members of our senior computer club. (I'm 71). Some of your hints are beyond the capabilities of our members, however, many would be perfect to pass along. I want to know if I can have permission to pass the hints to class members, giving you credit for the hint when I do. Depends on what you mean by "hint" :-). You can certainly share your knowledge, share links to my articles and the like. About the only thing that would technically be a violation of my copyright is if you were to print my full articles and distribute them independant of my web site. 2. Printing only one page of what might otherwise be more pages than one wants to. Great answer. I always wondered what that was. But you've now piqued my curiosity about another item when you write, "Finally, a use for the "Microsoft XPS Document Writer"." As I only have one printer connected, why do I see the "Document writer" listed as choice of printers? What is it and how do I use it? As I understand it, XPS is Microsoft's attempt to come up with a PDF competitor. In otherwords it's the same idea as print to PDF, but it prints to the less compatible XPS format. I think you're a bit hard on print to file, Leo. I used it when i was printing many copies of a large document (like a book), for two main reasons. Also - copy to PRN only works (for me) if my printer is connected to a parallel port, and dragging a PRN file to a printer icon also does not work for me. I just tried it again. The only way I've found that works is to share the printer and use a DOS box to copy the PRN file to the share name of the printer. I've never tried to drag a PRN file to a shared printer. A .prn file should be much smaller than a .PDF file. It can be used to circunvent driver shortcomings. The file contains the actual commands the printer supports and can be executed on an operating system which does not support the attached printer. For example, some recent printers do not have Windows 98 or Windows 2000 drivers. The printers can be "installed" in machines running those operating systems but using a "lesser" driver. For example, most LaserJet can be installed as "LaserJet III". But then features of the later models will not be available. If a document is prepared in a machine with the correct driver for the printer then eMailed as .Prn to the machine that uses the "lesser" driver, it will print just as it would print in the source machine.